FUSTER + Architects designing a hotel courtyard and bay and Mlaagaf Inspired by the local Caribbean architecture Archi-new - Free Dwg file Blocks Cad autocad architecture. Archi-new 3D Dwg - Free Dwg file Blocks Cad autocad architecture. Architectural office designed FUSTER + Architects on behalf of a boutique hotel El Blok is located in the town of Esperanza on the southern border of the island of veggies in Puerto Rico. The hotel is located within a small shopping gathered on the waterfront of the town. It features a built-ROM which includes 23 rooms, a restaurant and a terrace with Jacuzzi superficial alongside the service and attitudes areas. 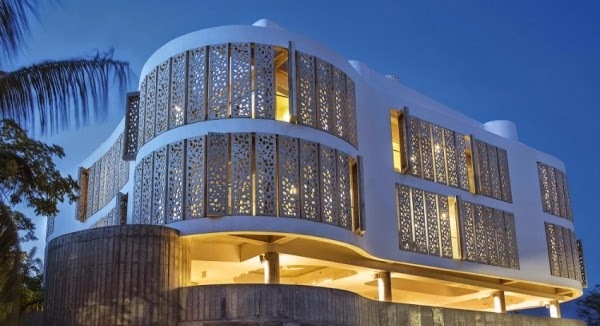 Architects visualize their hotel this piece of coral left the people of the sea on the beach; and so on the basis of this inspiration designed the exterior of the hotel from the panels of glass fiber reinforced concrete GfRC. These panels are working continuously as a screen (or as we call it mashrabiyya) Tfeltr natural light and fresh air to enter and balconies guest rooms. Also create models of natural light changes with the movement of the sun and gives a variety of interior decoration vacuum all the time. You can open some of those panels in order to allow guests to enjoy the beautiful views. Not only remember the address panels coral reefs, the outer curved, figure and winding mass of the building is also derived from the shape of the shoreline and the road parallel. Internal stairs lead in the lobby of the hotel, which opens like a fan to the first floor; where there is an open terrace restaurant and hotel. Distributed the hotel rooms on the second and third floors; surrounded radially inner courtyard ovoid refers to the local Caribbean architecture. This radial distribution and serve to reduce the distances of movement of inmates and the speed of access to and from the rooms. There is a roof terrace with Jacuzzi along with vertical heaters which operate outlets natural ventilation and lighting, or as it is called our locally (Mlaagaf) also includes service pipes and check a magnet vertical visual phenomenon seems from afar on the horizon. In the internal voids Architects used local materials such as local wood as well as concrete and bare concrete slabs for floors Alhaadrelik inspired by the colors of the Caribbean Basin. The building is seeking a certificate of gold Walid based on compact design approach in order to minimize its impact on the site and methods of enlightenment and natural ventilation, and so on.